The words at the beginning of tho new Telefilm Canada horror film DARKEN tells the audience: DARKEN is the resting sanctuary for all souls – whatever that means. 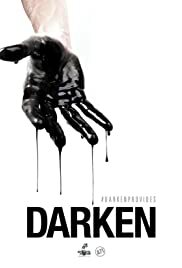 Darken is set in a bizarre, mysterious, and violent unknown world supposedly set with danger and death around every corner. Mother Darken appears to be the God in some alternative universe or different dimension. Her high priestess, Clarity (Christine Horne) and oddball looking and acting assistant, Martin (Ari Millen) accuse a member of their religious sect of betrayal. When the betrayer admits her guilt, she is stabbed and pushed out a door out of this universe. A nurse, Eve (Bea Santos) helps the wounded girl, but ends up entering DARKEN through a one-way door. The film plays like a children’s playground game adults that have forgotten to grow up indulge. The fight scenes are executed for more gore and violence that excitement. Lots of pain are inflicted on the wounded. Olunike Adeliyi playing an exile, Kali deserves an acting award for the most over-acting performance in a movie this year. She demonstrates how to act with her eyeballs, nose, lips and grimaces. The dialogue is terribly silly: “Mother (Darken) is terribly upset!” “Whenever I turn my back, they always disobey me.” “Mother is so angry with us.” – being a few examples. The character Clarity is exceptionally good at giving orders and doing nothing. The exiles use lighters that they somehow have, to light their way in the darkness though none of them smoke. DARKEN went on to win Best Science Fiction Feature at Buffalo Dreams Fantastic Film Festival, Best Fantasy Feature at Motor City Nightmares International Film Festival, and won four awards at Blood In The Snow Festival including Best Director and Best Cinematography. Whatever all these awards mean, DARKEN is not a very good horror film – overacted, overdone, unbelievable story – a textbook case of maximum effort and minimum results. But DARKEN is recommended for its unintentional humour!